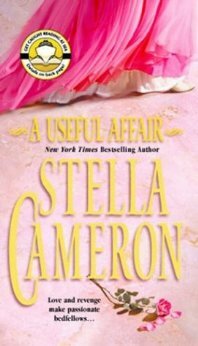 Two Stella Cameron classics. One great book. HIS MAGIC TOUCH: James St. Giles, Earl of Eagleton, returns to England to exact revenge on the Godwins. Darius and Mary betrayed his parents as they fled to China and the time has come for James to claim what is rightfully his. Irrepressible Celine, the Godwins’ daughter, will be brought out this season. This is a sham exercise to keep the truth quiet: she is to be married off to a businessman in order to help her parents line their pockets. James has excellent sources who bring him this welcome news and he wastes no time adjusting his plot to include Celine. But he soon discovers that breaking up the betrothal Celine dreads will have some unintended consequences. ONLY BY YOUR TOUCH: Edward deWorthe, the sixth Viscount Hawkesley, has devised a plan to avenge his brother’s death. He will wed, bed and ruin the stepsister of the man responsible for his loss. Lindsay Granville, however, is not what he expected. She is spirited and strong and she possesses a secret that compels her to resist Edward’s advances. As Edward stalks his prey, Lindsay finds herself passionately in love. Edward is shocked as his plan evaporates. 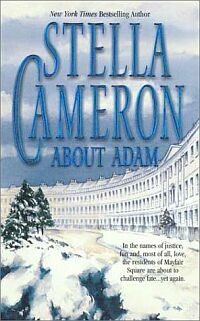 Two Stella Cameron classics. One great eBook. FASCINATION: Grace Wren wants to marry for love, but instead sacrifices her dreams to marry for money — and not just any money, she’s agreed to wed the ancient and ailing Lord Arran Rossmara. His lordship, however, is neither old nor ill. Arran did not expect a such a temptress to enter his home and he sets out to seduce Grace, incognito, to expose her as a shameless fortune hunter, but his plans go shockingly awry as he discovers his FASCINATION with Grace. 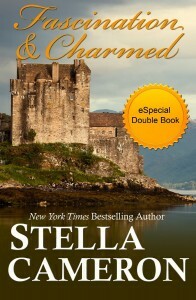 CHARMED: Callum Innes lost a dukedom before he even knew he had one. Switched at birth, he returns home after over 30 years of living someone else’s life. Now he is a man to be feared because he fears nothing — except the power of his need to punish his betrayers. Etienne, the false Duke, is betrothed to Lady Philipa Franchot whose dowry is something he would do anything to gain, including turning aside from his true passion. Lady Anabel Hoarville. Lady Philipa was betrothed to the Duke at birth, but Etienne isn’t that Duke. She belongs to Callum Innes, one more stolen right he intends to take back. Callum Innes lost a dukedom before he even knew he had one. Switched at birth, he returns home after over 30 years of living someone else’s life. Now he is a man to be feared because he fears nothing—except the power of his need to punish his betrayers. Lady Philipa was betrothed to the Duke at birth, but Etienne isn’t that Duke. She belongs to Callum Innes, one more stolen right he intends to take back. James St. Giles, Earl of Eagleton, returns to England to exact revenge on the Godwins. Darius and Mary Godwin betrayed his parents as they fled to China and the time has come for James to claim what is rightfully his. Irresistible and irrepressible Celine Godwin, the Godwins’ daughter, will be brought out this season. This is a sham exercise to keep the truth quiet: she is to be married off to a businessman in order to help her parents line their pockets. James has excellent sources who bring him this welcome news and he wastes no time adjusting his plot to include Celine. But James soon discovers that breaking up the betrothal Celine dreads will have some unintended consequences. Edward deWorthe, the sixth Viscount Hawkesley, has devised a plan to avenge his brother’s death. He will wed, bed and ruin the stepsister of the man responsible for his loss. Lindsay Granville, however, is not what he expected. 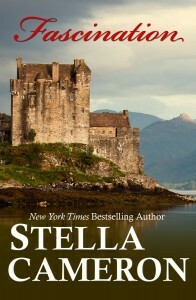 She is spirited and strong and she possesses a secret that compels her to resist Edward’s advances. As Edward stalks his prey, Lindsay finds herself passionately in love and Edward is shocked as his plan evaporates in ONLY BY YOUR TOUCH. Grace Wren wants to marry for love, but instead sacrifices her dreams to marry for money—and not just any money, she’s agreed to wed the ancient and ailing Lord Arran Rossmara. His lordship, however, is neither old nor ill. Arran did not expect such a temptress to enter his home and he sets out to seduce Grace, incognito, to expose her as a shameless fortune hunter, but his plans go shockingly awry as he discovers his FASCINATION with Grace. Beatrice Merryfield knows she will never find happiness in the marriage her father arranged. Victor Beresford, Earl of Willsly, needs the Merryfield’s money while Willsly’s title gives Beatrice entry into a society that does not interest her. Hoping to provoke Willsly to call off the wedding, Beatrice plots to ruin her reputation by running off with Guy Falcon…only Willsly won’t give up on Beatrice as easily as she expects. 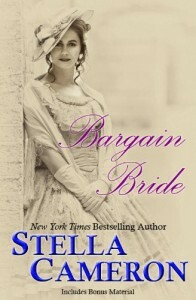 This version of BARGAIN BRIDE contains a bonus excerpt from Stella’s eBook re-release, FRENCH QUARTER. Fleur Toogood is beautiful, opinionated and has a disastrous inclination to speak her mind. And she refuses to marry without love. But as the most eligible of Reverend Toogood’s five daughters, she has been charged with making a brilliant match that will improve her family’s fortune. So to appease her father, she agrees to be escorted around London by Lord Dominic Elliot. But Lord Dominic proves to be a most arrogant and secretive chaperon. He takes his duties toward her very seriously, though he shows little interest in her otherwise. Worse, he insists on giving the most annoying advice—advice she doesn’t need because she has devised The List, questions designed to assess a male’s potential as a satisfactory husband, knowing no man can meet her high standards. But as she is introduced to one eligible gentleman after another, it becomes painfully clear—the only man who scores high enough to interest her is Dominic himself. The Marquis of Granville’s deadly efficiency makes him invaluable to the Crown. But his latest mission has nothing to do with his work for England and everything to do with avenging the murder of two members of his family. Killing would be too good for Bernard Leggit, the wealthy and corrupt merchant responsible for their deaths. Granville has a better plan: Seduce the old man’s young wife, Hattie, then let society know about their affair. For Leggit, living with shame will be worse than death. Hattie Leggit married her odious husband in a devil’s bargain to save her parents from debtors’ prison. She has a scheme for freeing herself from this private misery, but foiling Leggit is taking too long. The opportune arrival of the dashing Marquis of Granville inspires a daring new plan: Pretend to engage in a very discreet affair with Granville and make her freedom the price for not flaunting their liaison in society. When Hattie responds to him, Granville smells his revenge, but nothing goes as he had planned. Hattie drives him wild with need, until he finds himself forgetting his purpose. 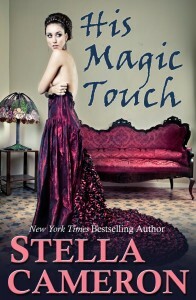 Although desire is new to Hattie, she manages to resist surrender—until love and yearning conquer all doubts. But will they join forces in time to outwit a vicious enemy with more murder in mind? Adam Chillworth—a hard man, yet a man of principle and honor, talented artist of 7C Mayfair Square—is desperately in love with Princess Desiréée. He could never have her, as she is a princess, he’s much older, and her guardian has a duty to find a marriage alliance for her. Princess Desiréée has been in love with Adam since she was a teen. Now a woman, she will go to any measure necessary to have this man for her husband. She devises a plan that will get her what she wants: the love of her life, Adam. While these two want each other, and while Adam holds his integrity to keep Desiréée untouched, circumstances arise beyond both of their control. One or both of them have enemies that will go to any extreme possible to keep these two apart, all in the name of hate. At the same time, there is a wondrous team of matchmakers, including Spivey, resident spirit, and the other residents of Mayfair Square who will also do anything to get these two together, all in the name of love.